The deadly bat disease has been confirmed west of the Mississippi River for the first time, adding to an already bad year for American bats. April 3, 2012, 12:21 p.m.
White-nose syndrome is now in Missouri, wildlife officials announced Monday, the first time the bat-killing disease has been confirmed west of the Mississippi River. While the discovery isn't a surprise, it is more bad news for North America's beleaguered bats, providing further evidence that WNS is on a path of destruction across the continent. Scientists reported in January that WNS has killed about 6 million bats since 2006, and last month revealed it has reached Alabama as well as two major national parks. Overall, the disease has hit 19 U.S. states and four Canadian provinces in six years, a rapid pace considering how little is still known about it. Scientists only confirmed last fall that a fungus called Geomyces destructans causes WNS, for example, and they still aren't sure how it travels. No one even knows how exactly WNS kills bats, but kill it does — in many infected caves, the mortality rate is 100 percent. That could be disastrous in Missouri, aka "the cave state," which has more than 6,300 known caves and is home to a dozen bat species. It also raises fears about where WNS might go next, since it's almost on the doorstep of the bat-rich Southwest. 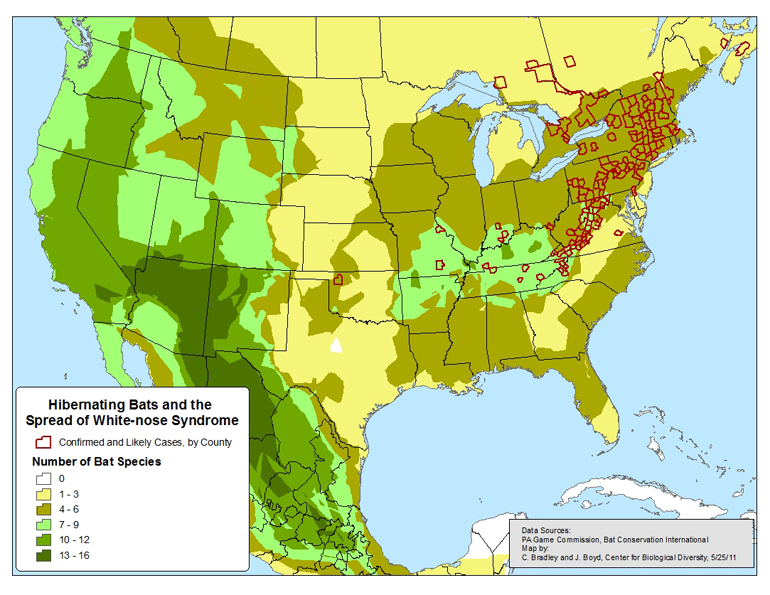 The U.S. West and Mexico in general are teeming with colonies of hibernating bats (see map below), making G. destructans' Mississippi River crossing especially ominous. "White-nose syndrome in Missouri is following the deadly pattern it has exhibited elsewhere," says Mollie Matteson, a bat specialist with the Center for Biological Diversity, in a press release. "First the fungus shows up on a few healthy bats. A couple of years later, the disease strikes. And if the pattern continues, we can expect that in another few years, the majority of Missouri's hibernating bats will be dead." Signs of G. destructans were first detected on six Missouri bats in 2010, but it didn't seem to be infecting them — and at that point, the fungus still hadn't been verified as the sole cause of WNS. But scientists now know it is, and now they also have proof that it's actively infecting Missouri bats: Tests confirm WNS in bats from two different (and undisclosed) caves in Lincoln County, both of which are now closed to the public. Cave closures are a common tactic to fight WNS, since fungal spores can stick to people's clothes or caving equipment. The disease is mainly spread from bat to bat, but experts say humans may be helping it jump from cave to cave. And as Missouri biologist Tony Elliot explains, keeping people out of caves also gives infected bats a better shot at survival. "Disturbing bats in caves while they roost or hibernate can increase their stress and further weaken their health," Elliot says in a press release. It remains unclear how G. destructans kills bats, but it's linked to an array of strange symptoms. One obvious sign is the white fuzz that grows on the noses, wings and other areas of a bat's body, but perhaps the most bizarre effects are behavioral. Infected bats often wake up too early from hibernation, becoming active and burning through their fat stores while it's still winter. They may also fly out of the cave and try in vain to hunt for insects that won't be available until spring or summer. Wildlife officials have repeatedly warned that WNS could wipe out entire bat species, and not just already-endangered ones like the Indiana bat. That would be an ecological crisis both aboveground and underground, since bats regulate insect populations on the surface and bring key nutrients to cave ecosystems in their guano. They're also an important food source for predators such as snake and owls. But from a human perspective, losing large numbers of bats would also be an economic disaster. Fewer bats means more flies, mosquitoes and other winged insects, including many that damage agricultural crops and spread diseases to humans. "Missouri is home to at least 12 species of bats," Elliott says. "They are our front-line defense against many insect pests including some moths, certain beetles and mosquitoes. Missouri's 775,000 gray bats alone eat more than 223 billion bugs a year, or about 540 tons." Nationwide, bats are estimated to save the U.S. agriculture industry at least $3 billion per year, or about $74 per acre for the average farmer. While Missouri is the farthest west that WNS has been confirmed, it may have already spread even farther — around the same time G. destructans was first detected in Missouri in 2010, it was also found in a bat cave in northwest Oklahoma.